These yummy sailboats are sure to please the little ones this summer. This snack is loaded with fresh summer fruits and cereals. Get your kids involved in the kitchen and ask them to help you make this. Cut orange into 6 slices and the watermelon into triangles. Insert a toothpick in each watermelon triangles. Stick in the oranges segments. Place cereals and other fruits on a plate. 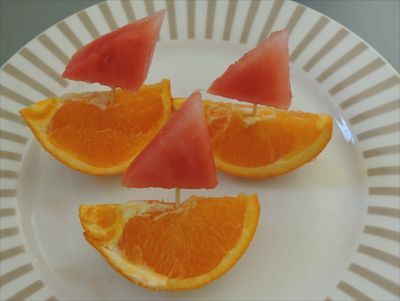 Place orange sailboats on top and your snack is ready.